In this article, we explain how to set a CNAME record within the DNS settings of your domain name. CNAME stands for Canonical name. With this type of record, you link a (sub)domain to another domain name. A common application of a CNAME record is to have the www version of your website (e.g. www.example.com) point to the website on your primary domain (e.g. example.com). Please note: CNAME records cannot be used for the primary domain (example.com). Where do I add a CNAME record? You can add all your DNS records easily and free of charge via your control panel. Go to the 'Domain & Hosting' tab and click the domain in the left column for which you want to set the CNAME record (do not check). How do I set a CNAME record? In the example below, you see an A record and a CNAME record for the site-example.com domain. 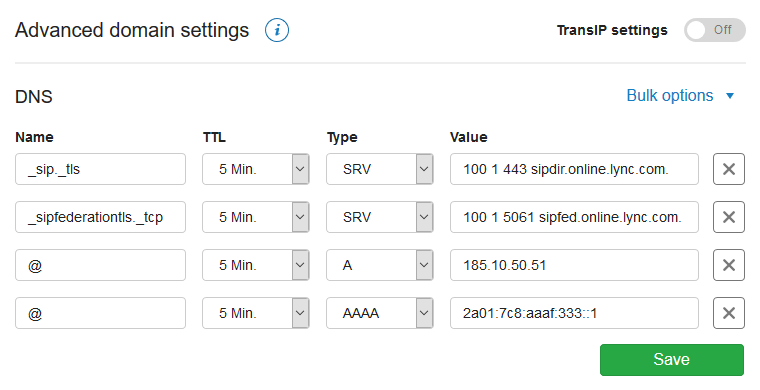 The A record ensures that the primary domain (with the name ‘@’) points to the IP address of the TransIP 'Reserved' page. When visiting site-example.com, you will now see the TransIP 'Reserved' page. The CNAME record is set for the subdomain ‘www’ and points to the main domain, which you can tell by the ‘@’ value. This way the DNS record of the subdomain 'www' always points to the same record as the A and / or AAAA record of your primary domain. You set a CNAME record by starting with the name. As mentioned, you can use a CNAME record for subdomains only. You enter a subdomain in the box under 'Name'. You do not have to enter the domain name here; our DNS software adds your domain name in the background. Because you want to set an CNAME record, choose 'CNAME' under 'Type'. As 'Value' you enter the domain name that the subdomain should point to. If the subdomain has to point to the same location as the primary domain, use @ as value. If the subdomain has to point to another subdomain of the same domain name, enter the subdomain as the value only. You do not have to enter the domain name here; our DNS software adds your domain name in the background. If the subdomain has to point to a different domain than the corresponding primary domain or a subdomain thereof, enter the complete domain name. You then complete the value with a dot, also called the 'trailing dot'. The trailing dot ensures that our DNS software does not also place your domain name after the value. Please note: The trailing dot can only be used for the value of a CNAME, MX and SRV record. Because you can only specify a subdomain or the primary domain of your own domain name for the name of a DNS record, it is not possible to use the trailing dot as the name. Below you see a correct and incorrect example of a CNAME record for the domain site-example.com. In this case, we have placed a couple of of our documents on documents.example.com. We would like us to be able to reach this page when we visit docs.site-example.com. Here, the name entered is not just the subdomain, but also the rest of the domain name. As mentioned, our DNS software ensures that the rest of the domain is filled in the background. By entering the name this way, the name is regarded as docs.site-example.com.site-example.com. It is therefore important that only docs is used as name here. Here, documents.example.com is filled in as value, without the closing dot. In this case, our DNS software also automatically places the entire domain behind the value, with the result being that the value is regarded as documents.example.site.example.com. In short: do not forget the ‘trailing dot’ when you want to point a CNAME record to an external domain. We have only entered 'docs' as a subdomain. This is correctly regarded as docs.site-example.com in the background. As value, we enter ‘documents.example.com.’. Pay attention to the closing dot, this is essential for the record to function correctly. As a result, the value will not be supplemented with the primary domain. This article has discussed the setting of a CNAME record. For a general explanation about DNS records and entering them, see the article ‘What is DNS?'. If you want to know how to, amongst other things, set the CNAME records of your web hosting package, use the article 'The DNS settings of my web hosting package'.